Mega Millions is one of America’s multi-state lotteries that regularly produces giant-sized jackpots. Like many other lotto games, Mega Millions has undergone changes both to the brand and the format over the years. Previously known as the The Big Game and then the Big Game Mega Millions, it finally changed to its current name Mega Millions in 2002. The minimum jackpot is $40 million USD, and each time it is won is paid in 30 yearly instalments, increasing by 5% each year. Mega Millions is most renowned for the largest jackpot win ever, a staggering $656 million USD was claimed on 30 March 2012 by three ticket-holders; from the states of Illinois, Kansas and Maryland. 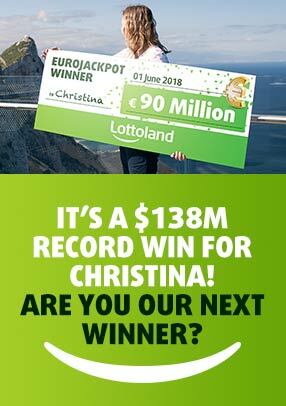 And if that’s not enough at Lottoland you could have played for over a billion dollars thanks to the exclusive DoubleJackpot feature. The biggest single winner of Mega Millions came on the 25 March 2011 drawing, where $319 million USD was claimed. Residents in the USA are only permitted to play the official Mega Millions lottery. At Lottoland you can still play from Canada and across the world when you bet on MegaMillions, and rest assured if you predict the winning numbers then you will be paid out as if you played the game officially. What is the format of the Mega Millions lottery? Mega Millions recently changed its draw format in October 2017 and is now 5 from 70 white numbered balls, and 1 “Gold Ball” from a range of 1 – 25. There is one further ball drawn from a range of 1 to 5 and this is known as the Megaplier. The Megaplier is an extra feature that if bought will multiply your winnings by the number drawn out, and is applicable to all the prize tiers except the jackpot. The Mega Millions jackpot has no limits either for the size of the pot or the number of times it can rollover. The change in format of the Mega Millions game means it is even more difficult to land the jackpot as there is a 1 in 302,575,350 chance of claiming it. The previous version had odds of 1:258,890,850 of winning the main prize. The second prize tier of $1 million USD is awarded for matching 5 main numbers, and if the Megaplier drawn is number 5, then you will receive $5 million if you added this feature. You can win the jackpot, Prize Category 1, by matching all of the draw numbers i.e. 5 of the balls drawn from 70 plus the Megaball out of 25. The total lottery prize money is divided into 9 tiers. How do I fill out a MegaMillions Play Slip? The MegaMillions Play Slip has 6 fields available for you to fill in. A single line requires 5 main numbers picked from a range 1 – 70, and 1 MegaBall out of 25. Each field tells you how many more numbers are required to complete a single line. At Lottoland if you decide to select more than 5 main numbers, then your selections will automatically be combined to enter all the possible different lines in the draw, and this is known as a Combo bet. This is a convenient way of playing for the serious lotto player or those who play as a syndicate and want to give each player a number to choose from. You can also choose to add a feature called MegaPlier that boosts your winnings in all prize categories except the jackpot. How much does a single ticket cost? The MegaPlier is a bonus feature that boosts your winnings in all prize tiers except the jackpot. The MegaPlier is drawn from 5 numbers and depending on which number will determine how much your prize is multiplied by. For example if you won prize category 2 of $1 million and the MegaPlier was number 5, you would end up with $5 million. Mega Millions takes place on Tuesdays and Fridays in the USA. What are the differences between the Mega Millions and Powerball lotteries? Both games have an additional feature called the Megaplier and Power Play, however whilst the Megaplier multiplies winnings by a number drawn (aside from the main prize), Power Play has a fixed bonus for each prize category except the jackpot. Currently Mega Millions holds the world record for the largest jackpot payout of $656 million USD on 30 March 2012, however Powerball is not that far behind with $590,500,000 USD claimed on 18 May 2013. Mega Millions and Powerball jackpots are both paid out over 30 years, Mega Millions awarded in yearly instalments that increase by 5% per annum, and Powerball is a similar graduated payment plan.